Kathmandu (AFP) – Wildlife experts in Nepal are tracking a rare snow leopard by using a collar with a satellite link to discover how climate change and human encroachment are affecting its habitat, officials said Wednesday. The male cat was captured in a snare at the base of Mount Kangchenjunga on the Nepal-India border last month and fitted with the collar which uses a GPS tracking system. “This will be a milestone in exploring the impacts of climate change and human activities on the animal’s home,” said Megh Bahadur Pandey, director general of the parks department. 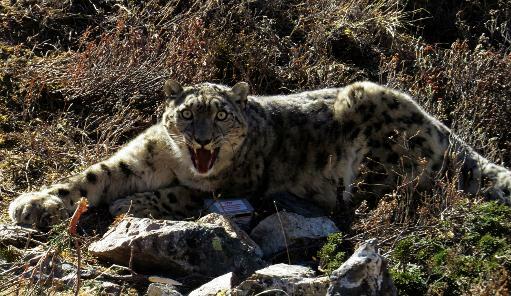 “The radio collaring of the snow leopard will help us understand its habitat,” he said. Climate change is causing temperatures to rise, meaning snow leopards must move further up mountain slopes where prey is scarcer and making it tougher for them to find food, experts say. Snow leopards also face threats from hunters who kill them for their luxuriant spotted coats and livestock owners who see the cats as a threat to their animals. Snow leopard bones and body parts are also used for traditional Asian medicine. The five-year-old leopard, which has been fitted with the collar, has been named Ghanjenjwenga after a 7,774-metre (25,505 feet) mountain in northeastern Nepal. Scientists are receiving data on its location and activities every four hours from the collar. Globally, the snow leopard population is estimated at 4,080 to 6,590 adults, according to the International Union for the Conservation of Nature, which lists the animal as “endangered”. Experts believe just 300 to 500 adults survive in Nepal. Few claim ever to have seen the solitary so-called “mountain ghost”, which lives 5,000 to 6,000 metres (16,500 to 20,000 feet) above sea level. A team of 10 Nepali and foreign conservationists trekked for five days to reach Kanchenjunga Conservation Area which is home to some snow leopards. The expedition was carried out with the help of global wildlife organisation WWF.